Filter packs used to remove chemical odors and vapors from the air stream. 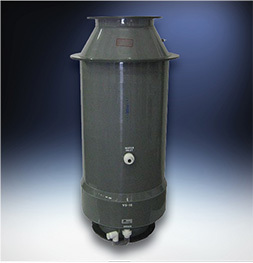 Manifold Fume scrubbers provide air pollution control for water soluble fumes and odors. Ductwork connected to fume hoods may be arranged in a variety of patterns depending on requirements. Generally, the best exhaust system involves the shortest duct length and the fewest elbows. Duct size, length, and number of elbows affect static pressure loss and blower efficiency. Ideally, each fume hood should have its own ducting and blower to maximize hood flexibility and reduce danger of backdraft from other hoods. Common or manifold ductwork designs can be used, provided duct and blower have been sized properly. In these designs, individual hood dampers are recommended to balance the system. 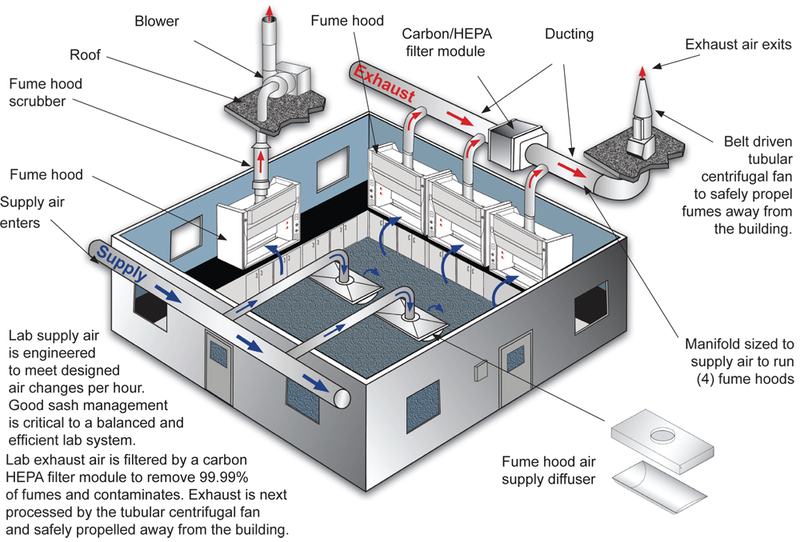 Hood users must be aware of how different hood exhaust fumes will react when mixed in the ductwork. Rigid PVC ductwork is recognized as an excellent fume hood exhaust duct material. The smooth interior surface reduces static pressure loss and chemical waste build up, and PVC is extremely resistant to a wide variety of reagents. For some applications flexible PVC lined duct provides adequate service and can significantly reduce installation costs. 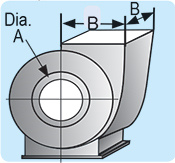 When planning exhaust ducting, duct size, length, number of bends, and exhaust material must be considered. 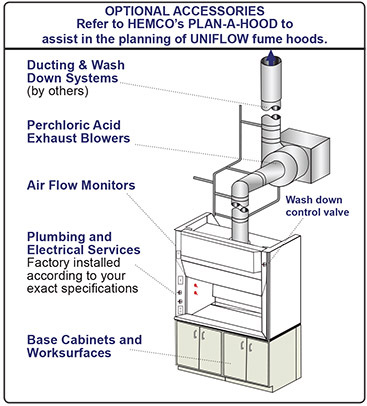 Consult HEMCO for Lab Ventilation Solutions. 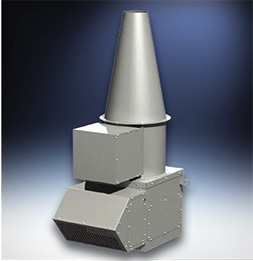 HEMCO offers a complete line of chemical resistant non-metallic exhaust blowers in belt drive or direct drive options in standard or explosion proof models. Ideal for applications where corrosion resistance is critical. 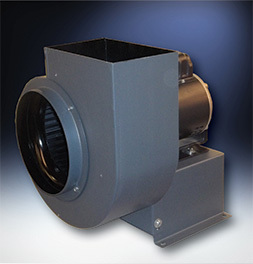 These blowers are available in polypropylene or fiberglass construction. end of the ducting which is typically roof mounted. 2. 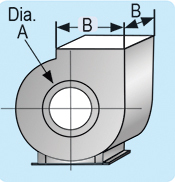 By keeping the exhaust duct as short and as straight as possible, the total resistance will be reduced and by keeping the diameter of the duct correctly sized to the flow volume, noise and static pressure can be reduced. 3. Blower wheels for polypropylene and fiberglass blowers are polypropylene. limit the sash height for operation. By having stop at a half open position, the total CFM can be reduced by 50%; thus by reducing the volume, energy loss, duct diameter, motor and blower size, and sound is reduced. • Housing is constructed of heavy gaged galvanized steel, with a baked enamel finish, to resist weather & chemical exposures. 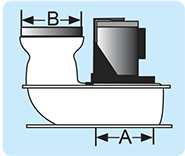 • Flange inlet collars enable easy connection to ductwork. • Wheel is dynamically balanced to minimize noise and increase efficiency. • Ball bearing pillow blocks are per-lubricated and resistant to both moisture and dirt. • Shaft is constructed of polished steel with a coating to prevent rust and corrosion. • Motors meet NEMA standards for single speed motors. 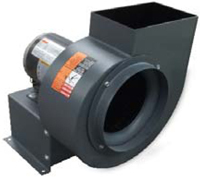 • These blowers are ideally suited for both supply and exhaust applications in laboratories, educational, pharmaceutical, industrial, and other applications. 1. Blowers should be mounted on the roof in-order that the ducting leading to the blower inlet is under negative static pressure. 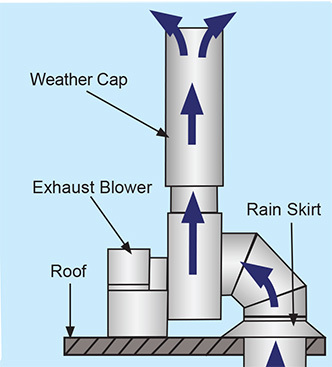 If exhaust blowers are mounted inside the building, all ducting connected to the blower outlet will be under positive static pressure, if a leak were to develop in the section of the duct inside the building, toxic and or hazardous fumes could be forced out of the ductwork and into that area of the building. a. Use vibration isolators or mounting blower exhaust assembly. b. Install a blower fan that will deliver the correct CFM and static pressure with the lowest practical impeller wheel RPM. If possible, use a duct size large enough to keep duct velocity under 1800 FPM velocity. 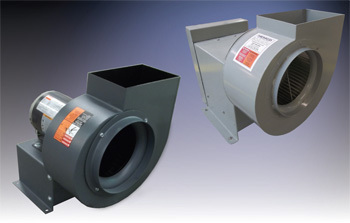 c. Use a flexible connection at the fan inlet to isolate mechanical transmission of noise from the ducting between the hood and the exhaust blower. d. Exhaust blower system should be designed with the fewest possible elbows or other fittings. Use radius type elbows & avoid using square elbows. Use gradual tapered transitions where necessary, & avoid abrupt changes in configuration or cross sectional area. 3. When ordering an exhaust blower, specify the orientation of discharge desired. 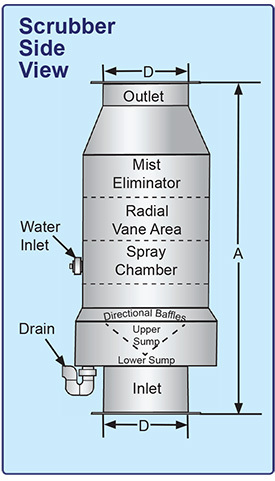 Vertical up blast discharge is the most common and will be supplied unless otherwise specified. 4. All fans are shipped with clockwise rotation when viewed from the motor end of the assembly. 5. For normal usage, the standard for both the blower housing and impeller wheel is epoxy coated. 6. Blowers used for hood exhaust at altitudes above 1,000 feet, may require a correction factor to provide the correct CFM and static pressure. Contact factory for details relating to your specific application. Motor speed control can be used to manually adjust blower cfm. Adjustable speed control for 3-phase motors 3/4 to 10 horsepower at 230/460 volts and 50/60Hz. these drives provide high operation efficiency and constant input power factor throughout the entire speed range of 3 to 60Hz. Drives are rugged, reliable and backed by years of manufacturing and application experience in motors and controls. These drives are tailored to the variable torque loads in fans or fume hoods. A complete line of belt and direct drive exhaust blowers that are chemical resistant and available in standard and explosion-proof models. 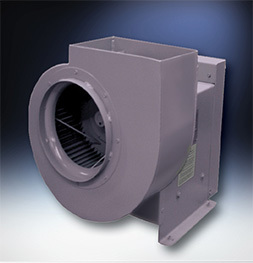 HEMCO blowers are designed to operate effectively and efficiently to remove noxious and hazardous fumes. 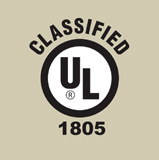 Standard 115V 60Hz & International Electrical Configuration of 220V 50Hz AC available. Standard motors are 115V, 60Hz / 1 phase. Explosion proof motors are 115/230V, 60Hz, 1 phase. Other voltage, hertz, and phase motors are available. High efficiency impellers produce low power consumption, reduced operating costs and quiet operation. 20 forward curved blades, in fire retardant polypropylene. Non-static and oil resistant V-belt, cast iron pulleys, adjustable pulleys available, adjustment for tensioning and belt replacement. 230V explosion proof, non sparking, chemical resistant for hostile or hazardous environments. 115V single phase or three phase. Non-static and oil resistant V-belt, cast iron pulleys, adjustable pulleys available, adjustment for tensioning and belt replacement. Constructed of halar-coated steal & feature V-belt adjustable sheave drive, TEFC motor, non-sparking wheel, wash down nozzle, drain outlet, inlet & outlet flanges, & weather cover. Note: Blowers below are sized for 100 FPM. Sash in full open position should be for setup of apparatus & maintenance service only. If opening is at 1/2 open at 120 fpm (feet per minute), face velocity at full open would be approximately 60 fpm. The recommended face velocity for perchloric acid fume hood efficiency & safety should be 120 fpm. Lower face velocity may compromise user safety. Size Hood 48" 60" 72"
the right are based on 120 Fpm face velocity. 1. Flexible Ducting neoprene impregnated fiberglass reinforced with steel helix wire. Standard 12’ lengths. Each piece includes two strap clamps. 3. PVC Coupling required to connect straight sections. 4. PVC 90 degree Elbow used in order to offset obstacles. Has belled ends for duct connections. 5. PVC 45 degree Elbow used in order to offset obstacles. Less static pressure loss than a 90 degree elbow. Has belled ends for duct connections. 6. PVC 45 degree WYE lateral for joining common ductwork in multiple hood designs. Branch diameter may be sized to 2” to 4” smaller than main diameter. Has belled ends for duct connections. 7. 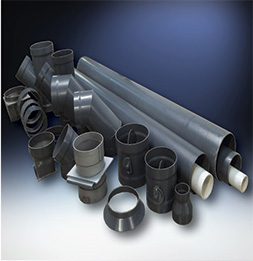 PVC Tee used in manifold exhaust systems. Has belled ends for duct connection. 9. PVC Blast Gate Damper a gate that slides in and out to control cfm. Has belled ends for duct connection. 10. PVC Rain Skirt slips over straight pipe on roof to slope water away from cutout. 11. PVC Vent outlet for horizontal venting through wall or window. Angled end prevents rain from entering. Male connector included. vertically away from roof. Self-draining. Minimal static pressure loss. This is the recommended weather cap. 13. Round to round transition to smaller duct diameter. 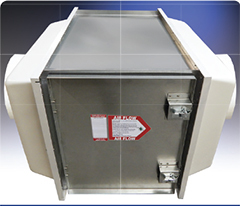 Clean-Aire HEPA and Carbon Filter Paks are designed to be mounted incline in the exhaust ducting from a fume hood or contaminant source up to 1500 cfm. 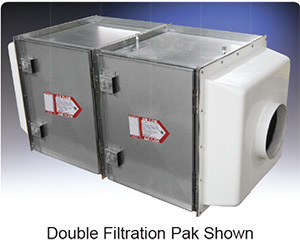 The filter pak includes a galvanized steel housing with hinged and gasketed access door for filter change-out and molded composite resin inlet and outlet plenum with duct connection collars sized to meet specification. Both filters include a 30% pleated prefilter and can be paired together for applications that require particulate and fume removal. HEMCO HEPA filter paks effectively collect particulate contaminants from the exhaust air stream. HEPA filters are 99.999% effective at removing particulate .3 micron and larger. The filter pak housing features a hinged access door with gaskets and spring latches for convenient filter change. Inlet and outlet plenums with duct connection collars are installed. The HEPA filter pak can also be paired with a carbon filter pak to remove chemical fumes and odors. 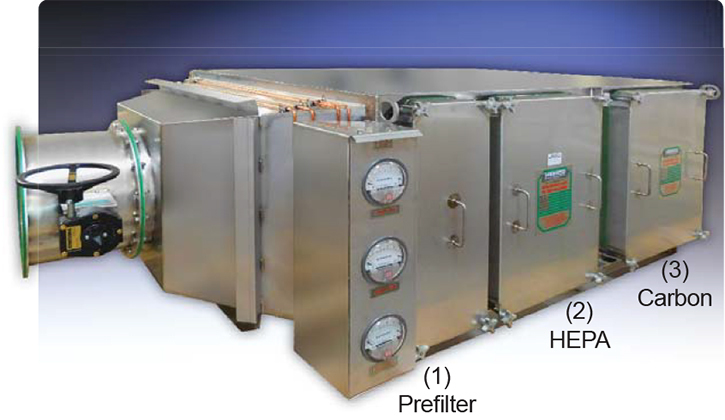 Note: HEMCO recommends a minihelic or magnetic gauge to monitor the airflow differential across the filter. The static pressure indicated would alert when to change filter. The gauge can be hood or filter mounted. We recommend ordering a back-up replacement filter. Filter Housing is fabricated of type-304 stainless steel & requires (1) carbon filter absorber, (1) 24” X 24” X 2” 30% pleated prefilter & (1) bag. 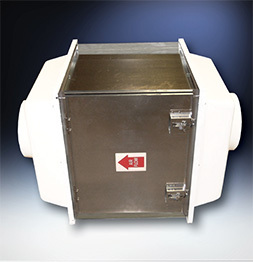 Bag-In bag-out filters are designed to meet air filtration requirements to handle hazardous fumes and vapors. The housing incorporates a ribbed bagging ring around the side access door over which a specially designed plastic bag is attached. Filters are then installed and changed through the bag to reduce the risk of exposure to personnel. Note: The carbon filter is not included with the housing. We also, recommend the sampling kit below to check if there has been a break through in the carbon filter, and ordering a back-up replacement filter. 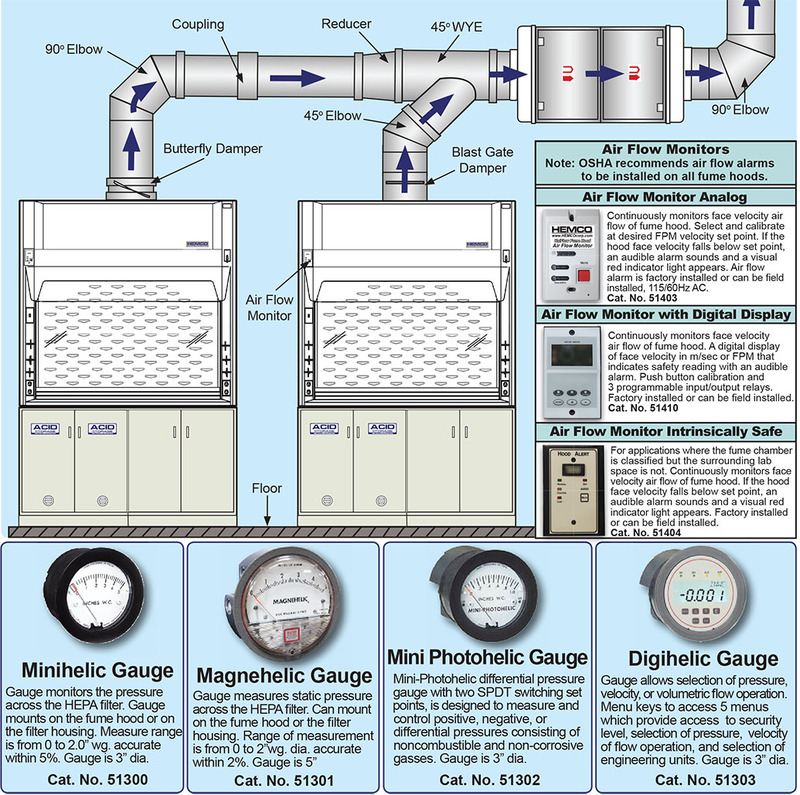 Gauge measures static pressure across the HEPA filter. Mounts on the fume hood or the filter housing. Range of measurement is from 0 to 2” wg. Gauge is 5” dia with 2% accuracy. HEMCO carbon filter paks are used in laboratory exhaust and supply systems to remove chemical odors and vapors from the airstream. Filters are loaded with virgin coconut activated carbon to efficiently absorb organic solvents and acid fumes. The filter pak housing features a hinged access door with gaskets and spring latches for convenient filter changes. Inlet and outlet plenums with duct connection collars are installed. The carbon filter pak can also be paired with a HEPA filter pak to collect particulate contaminants. Note: A standard “01” activated carbon filter for organics is included. HEMCO recommends the sampling kit to check if there has been a breakthrough in the carbon filter, and ordering a back-up replacement filter. Bag-In bag-out filters are designed to meet air filtration requirements to handle hazardous fumes and vapors. The housing incorporates a ribbed bagging ring around the side access door over which a specially designed plastic bag is attached. Old filter is removed then new filters are then installed and changed through the bag to reduce the risk of exposure to personnel. Note: The carbon filter is not included with the housing. We also, recommend the sampling kit below to check if there has been a break through in the carbon filter, and ordering a back-up replacement filter. 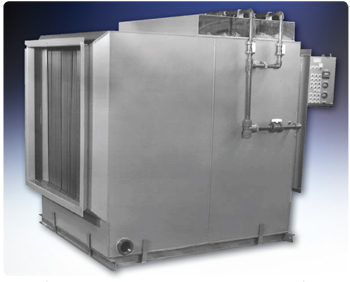 The filtration system is rated at 1800 cfm & includes a stainless steel housing with lift off and gasketed access doors for filter change-out and inlet & outlet plenums with duct connection collars sized to meet specification. Bubble tight dampers allow system to close off for filter change. • Initial change out bags supplied. a minimum of 1-1/2” wide. • Approx. operating weight: 1350 LBS. • A minimum of four (4) feet of clearance in front of access door is recommended for filter change-out. 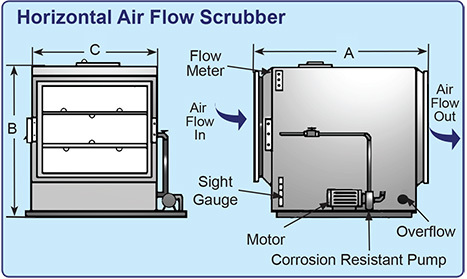 Scrubber systems offer high efficiency and minimal maintenance on meeting pollution control requirements. Can be supplied for installations where the scrubber is located outdoors and the possibility of freezing is present. Fume Scrubbers provide excellent air pollution control for water soluble fumes and odors by moving contaminated air through a filter pack media exposing over forty square feet of surface per cubic foot. Containment is collected on filter media surface and rinsed off with water, excess water is then mechanically removed and cleaned air is released. When conditions require, chemical additives can increase absorptive capacity of the scrubber. Unit includes integral recirculation tank and pump which significantly reduces water consumption and related waste disposal costs. Fan is not included, must be sized to meet exhaust requirements. Request a Plan-A Scrubber specification sheet for planning your scrubber. The above efficiencies are intended as a guide representing average values. Specific combinations and concentrations of fumes may result in a significant variation from the above. * Requires extended packing depth and chemical addition to scrubber solution. The Fume Hood Scrubber is designed for laboratories that require removal of acid vapors from exhausted air, under the most demanding corrosive environmental conditions. 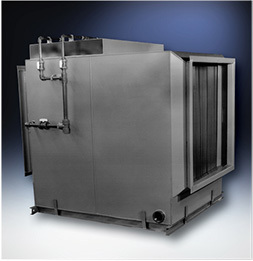 VS Scrubbers are compact vertical venturi units for indoor installations. 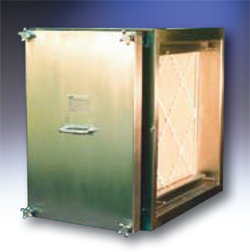 •Can be ducted if necessary to meet venting requirements. Designed to offer the complete solution to laboratory ventilation concerns. 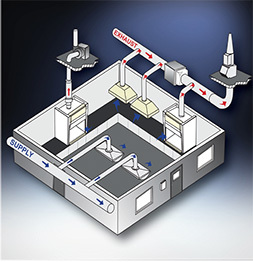 Integrated components, blowers, fume scrubbers, and ducting are engineered together to provide a safe, effective, and efficient fume hood ventilation system. VAV controllers minimize the amount of conditioned air that is exhausted through the fume hood. Laboratory supplemental air supply package is designed for situations where there is a shortage in availability of proper air supply to fume hoods. Supplemental air supply package serves as a alternative to auxiliary air hoods by diffusing make-up air to the laboratory rather than creating turbulence at the face of the hood. includes: 2’ x 2’ ceiling diffuser, prefilter, flexible ducting, and fan. Proper placement and use of fume hoods and blowers are important laboratory ventilation requirements. HEMCO offers the following suggestions to help in your laboratory layout. Please feel free to contact HEMCO’s technical support team in order help with your laboratory needs. Room airflow patterns and user convenience are the most important considerations in planning the location of hoods within the laboratory. Hoods placed directly in front of doors, open windows, or air conditioning registers will not perform efficiently. The drafts interfere with the airflow into the fume hood. 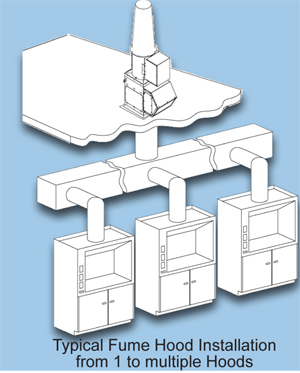 When common exhaust or supply systems are used for several hoods, the hood units should be arranged so minimum amount of ductwork is required. 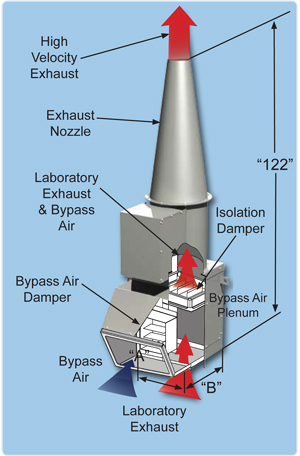 Hoods used as part of an air conditioning system to exhaust air from the laboratory should generally be located on the opposite wall from the side-wall inlet registers. The hoods should be placed so that air from the registers or diffusers sweep through the laboratory area first then into the hoods. Consult Lab Safety Officer for correct use of fume hood. Hoods should not be used as laboratory storage space. Unnecessary material or unused bottles and flasks can block exhaust openings and interfere with hood performance. 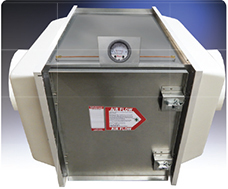 OSHA requires an fume hood be equipped with an Airflow Monitor to track airflow velocities and warn operator of potentially dangerous low air flows due to damper, blower failure, blockage of ductwork system, or extreme sash opening height. Blower systems must be installed and maintained in order to control the amount of air movement through the hood. Select a blower with a large enough capacity for your application and set-up. Allow for some drop in capacity from fouling by dust and other contaminants. 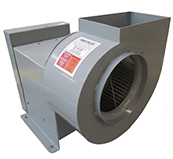 Blowers and ductwork should be arranged so that pressure loss in the system is minimal. Minimize the quantity of elbows and other restrictions. The shortest and straightest arrangements are the most effective and efficient. It is suggested that each hood have its own blower and ducts for maximum flexibility and to avoid back flow from other hoods. Ductwork systems will also perform efficiently, provided ducts & blowers have been properly sized for the number of hood units in the system. elbows to a minimum, the air will be under negative pressure; thereby, should a leak occur, clean air would be pulled into the duct rather that contaminated air being pushed out. 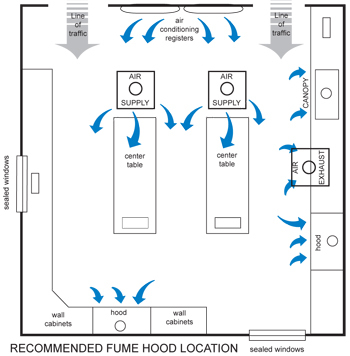 Where fume hoods are used as part of the laboratory ventilation system, blowers should be in operation at all times. Regular maintenance of blower and ducting will increase the efficiency of your fume removal system. but output will be greatly reduced. 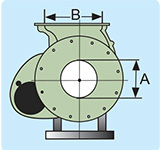 The above figures show various suggested arrangements of ducts and blowers. 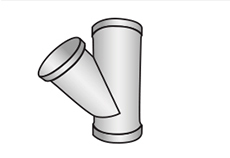 Blowers may be installed within the lab, on the roof, on an external wall, or in the fume hood itself. Your choice of arrangements will depend on your particular laboratory location and set-up, facility policies, and building codes.